More and more people are starting to ask about the Inspire therapy. Basically the Inspire device is an implanted system that senses breathing patterns and delivers stimulation to key airway muscles, which keeps the airway open during sleep. 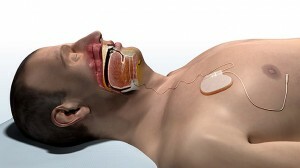 Some people have called it the sleep apnea pacemaker. Its the same goal as other key treatments for obstructive sleep apnea through a minimally invasive procedure. Currently we really only consider after CPAP refusal or failure. It has been designed for patients with moderate to severe OSA (AHI 20 to 65). You should not be on this if you have central or mixed apneas. The STAR trial were published in the New England Journal of Medicine. On April 30, the FDA approved Inspire UAS. As with any surgical procedure there is an Infection risk. It is important to note that the surgery in no way alters facial or airway anatomy. As such, the procedure is less invasive and should result in a shorter recovery time. It’s uncertain what the long-term side effects are of continuously stimulating the hypoglossal nerve.